The Senate Appropriations Committee is expected to consider the Labor, Health and Human Services (LHHS) bill that will provide fiscal year (FY) 2014 funding for the National Institutes of Health (NIH). Although we don’t know when the House Appropriations Committee will vote on NIH funding, the spending limits in the House Budget Resolution could mean another 18 percent cut for biomedical research – below sequestration! NIH needs $32 billion in FY 2014 to prevent further erosion of the nation’s capacity for biomedical research and provide funding for additional grantees. Please go to http://capwiz.com/faseb/issues/alert/?alertid=62750436 to email your Senators and Representatives today to urge them to support $32 billion for NIH in the FY 2014 LHHS Appropriations bill. When you are done sending your email, forward this alert to your friends and colleagues to make sure that the voice of the biomedical research community is heard across Capitol Hill! FASEB (Federation of American Societies for Experimental Biology) is the United States’ largest coalition of biomedical researchers, representing 27 scientific societies and over 110,000 researchers from around the world. FASEB is now recognized as the policy voice of biological and biomedical researchers. July 1st, this coming year’s installment on both my AIDS grants came in, less 10% eaten by the Sequester Monster. I’m fortunate 1) to have funding at all, since NIH barely funds 10% of new grants, and 2) to have a hard money job (BC pays my salary). Most of my friends doing research in AIDS, cancer, drug addiction and infectious disease have to cover most or all of their salaries out of the same grants that support their research, such that cuts means they will lose their labs, and in some cases, their jobs (meanwhile, nations like China and Singapore continue to pump money into research, having learned from the US and Europe that innovation PAYS). I have had no less than FOUR desperate colleagues ask me this month what they are supposed to do now – four established, productive scientists that the US stands to lose. Four people that the US invested in, whose research will slow down or stop before those investments pay off. And no political finger pointing! The problems predate the current administration and both parties have their favorite ways to muddle up US science. Maybe it’s time to elect at least some scientists to office (from either party? Please?)? Instead of more MBAs, lawyers and career politicians? The NIH funding request is $31.3 billion in FY 2014, a 1.5 percent increase over FY 2012, but amounts to a real cut when inflation is considered. As compared to the FY 2012 enacted level, the budget supports 36,610 research project grants, an increase of 351. – $6.2 billion is requested for research and related activities, an 8 percent increase. The Agriculture and Food Research Initiative (AFRI) would receive $383 million or a $119 million increase over FY 2012, for competitive research grants. – $1.3 billion is requested for the National Institute of Food and Agriculture (NIFA), a $7 million decrease from FY 2012. Also remember that with inflation, “flat funding” actually means “declining funding.” We’ve apparently reached a point where American scientists and science advocates are no longer even bothering to argue that research funding should go up – they’re just pleading desperately to make it go down a little bit less. Man, this is grim. research is international and should have one international budget. The whole world benefits from the same research. a good thing for the world, although maybe bad for American scientists. 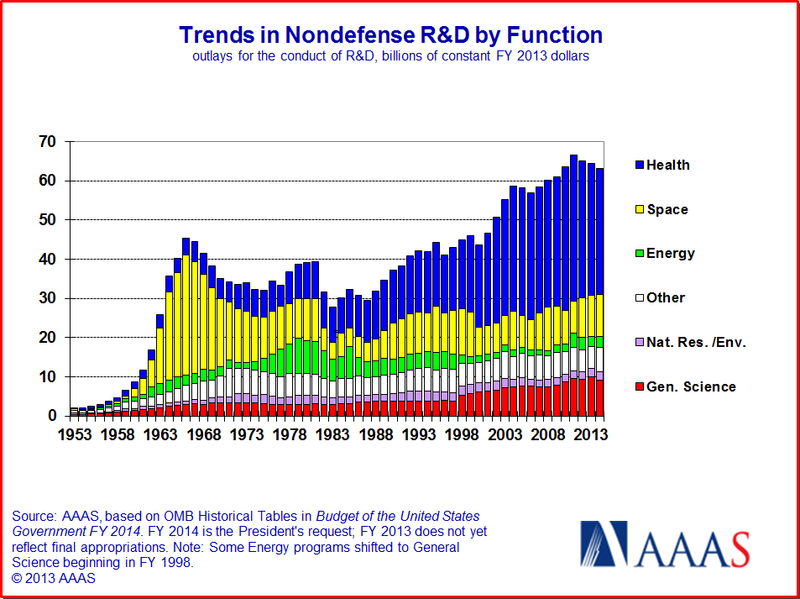 I think it’s quite clear that money for science research in the US is not going up any time soon. It’s time to find other ways to make what we do get go farther. One rests squarely on universities: they need to pay more scientists salaries than they are now doing. An good sentiment that is not likely to ever happen (one international budget). As for cheaper science elsewhere, many companies outsource some types of scientific research overseas (China, India, even Europe) because it’s cheaper there. Perhaps university labs should take a page out of the CRO playbook: seek contracted research & development projects that are in their area of expertise to supplement the traditional grant cycle. From experience – i know it takes a completely different mindset to win, and deliver, on a research _contract_ originated from a DOD RFP (for example) vs. an NIH RO1 grant – but it’s a good means for university labs to find continued support. Maybe I’m jaded since I came out of grad school during the upswing in the early 2000’s – but I feel that the old paradigm of “publish or die” has become “partner or die”. Labs that are part of larger “team science” ‘omics programs or who have corporate support seem to be doing the best in this climate. Seems like this would be an area ripe for crowdsourcing. Has anyone looked at a non profit Kickstarter-type project to fund research?